I'm not sure if his name should be Hermint, because evidently that's what my son believes them to be called. So Herman (mint) is his name. His second name, as Trev put it, is Frodericks. Which I can certianly appreciate. We're very fond of him already. He hasn't gotten much sleep this early afternoon (they are nocturnal, you know) as we are thoroughly excited to have a new member of the family. And we keep checking on him to see what this spectacular creature is up to. He's been fed crackers, and strawberries - along with his pellet food, and we are in general doing our very best to make him feel comfortable, and to give him a sense of belonging. The guy at Petco said they're social creatures but that he'd be alright solo - the book says to get him friends (of his own size). So that's what we'll do asap. Two more should do it, shouldn't it? 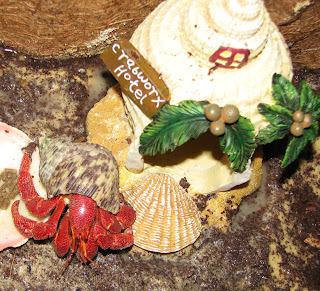 He is a Strawberry Hermit Crab. A large, superb creature.